The used Lincoln Continental is a vehicle that was made by the Ford Motor Company starting in 1939 to 1948, and from 1956 until 2002. About fifteen years ago, sales began to suffer and the company announced it would end production on this model. This car had been a distinctively styled model, along with being a very well equipped luxury sedan throughout its long history. Nine generations of the Continental were made over the years. This model completely changed it appearance on the interior and exterior over fifty years. In the 1980’s, the Lincoln Continental was reduced to a mid-size model similar to the Ford Taurus platform. 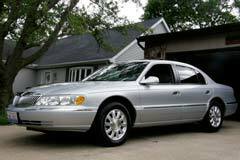 From 1995-2002, this vehicle featured a 4.6L V8 engine and a 4-speed automatic transmission. In 2001, a special limited edition model was made and it featured a very unique leather interior, wood steering wheel, and spoke aluminum wheels. In 2002, a collector's edition was made to commemorate the last year the car was built. Its steering wheel was made from genuine walnut burl and it also had a platinum painted grill.